Homemade Microdermabrasion: There is fresh looking skin under there! I do not consider myself a shallow person. I don't Botox or spend hundreds of dollars on anti-aging serums. But when I noticed a wrinkle beginning to form on my brow, three words popped into my head: WTF!? I'm only 31. A wrinkle? Really? I used to hear older women complain about them, and would think to myself, big deal. It's a natural part of aging. Get over it already. I'd like to go back in time and smack 25 year old me in the face. Still, I do not consider things like botox or plastic surgery as being options. They just creep me out. Therefore, I look for alternatives--something I can do myself at home that wont cost a fortune. And that is how I stumbled upon a very simple idea: baking soda. Baking soda is a cheap exfoliant, which means that you can use it often without breaking the bank, and it will remove dead skin cells, revealing the beautiful, healthy skin beneath. When you use baking soda, remember not to rub it in too hard. Just gently massage it over the face and neck--the little baking soda particles will do their work just as well when gently massaged. You can do this treatment as often as every other day, but once a week would probably suffice. I noticed a difference after the very first time that I tried this! I highly recommend it! Combine baking soda and water in a small bowl to make a paste. Using your fingertips, gently massage this paste into your face and neck, avoiding the delicate areas around they eyes. Use circular motions and apply only a light pressure while rubbing. 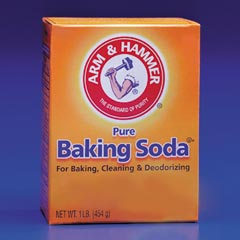 Massage the baking soda into the skin for a few minutes. Then, rinse with warm water and pat the face dry. Follow with a gentle toner and then a moisturizer. I have some recipes for toners and moisturizers in a past blog: Homemade Skin Care. Now, if you are feeling quite ambitious, you can make an even more effective rub using an infusion of calendula petals and some essential oils. Combine all ingredients in a small bowl to form a paste. Using your fingertips, gently massage this paste into your face and neck, avoiding the delicate areas around they eyes. Use circular motions and apply only a light pressure while rubbing. Massage the baking soda into the skin for a few minutes. Then, rinse with warm water and pat the face dry. Follow with toner and moisturizer. Coconut Oil: I have been using plain, raw coconut oil as a nightly moisturizer. After cleansing and toning at night, I gently massage about 1/2 teaspoon of coconut oil onto my face and throat. In the morning, I rinse my face with plain water and use my toner. Then, I mix a bit of my foundation with a little coconut oil, and apply my makeup. Pineapple Juice: This has fast become one of my favorite skin treatments, because like with the baking soda, I noticed an immediate improvement. You will need a fresh pineapple for this, as canned juice will not work--it has been heated, and this destroys the enzymes needed. Simply squeeze about a tablespoon of juice from a little chunk of pineapple. Gently rub this juice into the face and throat, avoiding the eyes. Leave on for 5-10 minutes, and then rinse with warm water and pat dry. Water: No, not to apply to the skin. To drink! Stay hydrated. Water keeps the skin plump and healthy, so make sure to drink enough of it! It has never even crossed my mind to use baking soda as a facial exfoliant but I will definitely be trying it out! Thank you! Coconut oil ( I just recently discovered) is comedogenic so it's not the best for your face, especially if you have oily skin or larger pores. Olive oil, sweet almond oil, sesame oil, argan oil are all non-comedogenic and will all work just as well. I massage all over to loosen makeup then use a warm face flannel and usually find I don't need lotion afterwards. Thanks for reading and the comment, I really do appreciate it when I get feedback. As I understand it, raw coconut oil contains large amounts of lauric acid, which is anti-bacterial, anti-fungal, and anti-viral, making it great for facial skin, especially if you are prone to break-outs. Many people with acne problems have had great success using raw coconut oil as a facial cleanser. I personally use it as a moisturizer, and have had virtually no pimples since I stared using it. Everyone's skin is different however, so I think the other oils you suggested (olive, almond, sesame) are definitely worth trying if the coconut oil isn't working well with your skin type. I break out every time I use Extra virgin Coconut Oil. I have tried it in my Oil Cleansing for the face, moisturizer, and in a DIY lip balm and all resulted in breakouts including my lips. Pores on my lips got clogged and resulted in two small clear blisters when I was using my coconut oil lip balm. I then used Vitacilina (Mexican antibiotic ointment similar to the texture of vaseline) daily and that did the trick even after accidentally popping them which hurt quite a bit. I will never use coconut oil on my skin ever again. I am glad it is working for you but do take into regard the high comedogenic rating of 4 out of 5 in clogging pores. I was wondering why I was getting painful cystic acne when using it on my face and the blisters on my lips until I noticed its high rating :( My face does love Extra Virgin Olive Oil though! Ouch, sounds like a painful experience! Thank you for sharing! People should definitely do what works best for their own skin type. I'm glad that you have found olive oil to be so beneficial to your skin. I remember reading once that Italian women rub olive oil into their skin to keep it looking healthy and beautiful. What exactly does the pineapple juice do? Does it help exfoliate like the baking soda or is it more of a toner? Raw pineapple juice contains an enzyme called bromelain. Bromelain basically digests proteins (which is why pineapple juice also makes a great meat tenderizer). When you apply pineapple juice to your face, the bromelain will dissolve old tissue from your face, revealing the fresh, new skin beneath. Interestingly, there are many studies indicating that fresh pineapple juice applied to burns and wounds can help speed the healing process since it removes the dead skin tissue, promoting healing--though it should not be applied to open wounds. Hi! I am excited to find out one thing, of course if that's not too much to ask could you please tell us where you grew up? When something goes wrong with your facial skin as a result of acne breakouts, burns or aging and there are large pores prominent on your skin then you should always go for microdermabrasion with ultrasound. Thank you for your information, very interesting, I am going to try. I love using baking soda for my home made scrub and while taking bath, I always add 1 cup of baking soda and i cup of salt for detox bath. I'm contemplating adding this to my clinique foaming cleanser and kicking two birds out with one stone. How actually dose Microdermabrasion works? I totally get what you mean about wanting to go back in time and giving your younger self a smack in the head. Haha! It’s easy to ignore those wrinkles and aging problems when you’re young and still have that youthful glow. Yes, aging is a part of nature, but you could've kept them at the bay or at very least, and age beautifully when you know how to take care of yourself, even at a young age. You should take care when using baking soda. Although it is an effective exfoliating agent, it might dry up your skin when overused. Well, good thing you know how to take good care of your skin, by keeping yourself hydrated inside and out. That’s actually the best way to keep your skin healthy at all times. Thanks for sharing! Hi everyone! I've not tried the baking soda. But I have used an oatmeal, honey, and olive oil mix to exfoliate. I've also used coconut oil. So I've had success with both. That’s right! You’re certainly too young to be sporting wrinkles. I hope this homemade microdermabrasion solved your predicament. I see the things you shared here are mostly made of natural ingredients. Though they can work wonders, it may take quite a while for you to see a noticeable result. Nonetheless, thanks for sharing!